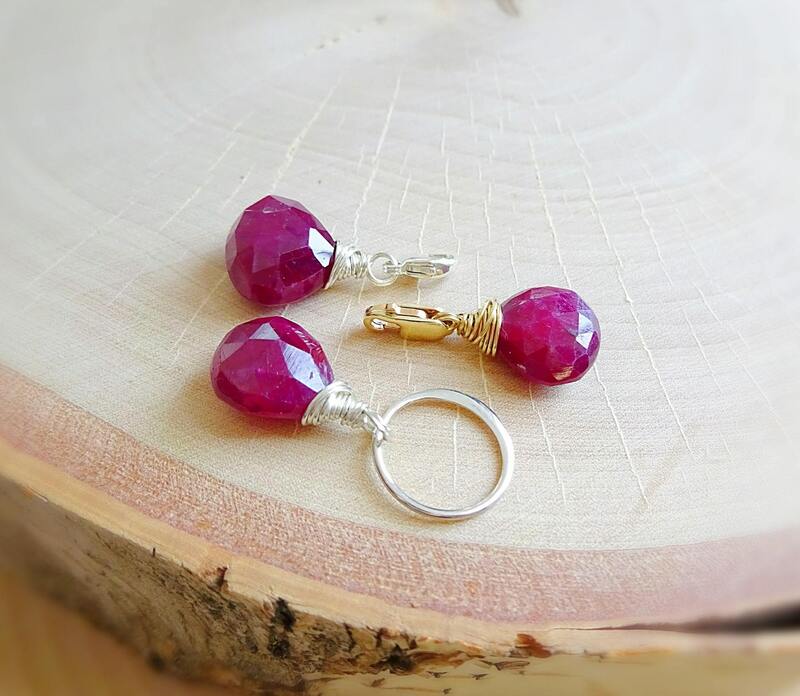 Use this wire wrapped natural ruby pendant to slide onto your own favorite necklace, or purchase one of our own versatile chains to create your very own look! Collect our natural gemstone pendants and create unique styles that you can mix and match or group together. The size of this pendant is approx. 1/2" of an inch in length and 1/2 of an inch at its widest point (about 10mm). This size does NOT including the 9mm trigger clasp or 12mm eternity ring (depending upon your finishing choice) that is joined to the top of the stone. Our pendants are available with the options of either a trigger clasp, or an eternity ring. The ring will allow you to slide the pendant onto anything at all, be it a chain, or leather cord lacing, easily. The trigger clasp is more dainty and is great for not only attaching to chains of all kinds (especially if you want to keep the pendant in ONE spot along a cable chain), but is also required for attaching the pendant to any other ring, such as the one shown in the example. The stones are available in either sterling silver or 14k gold fill. Both metal finishes are nickel free and safe for all wearers. All stones are 100% natural, not lab created. Please expect some minor differences between each piece as nature dictates the various unique attributes of each gem and we have no control over such variations. Each stone is perfectly unique, just like you.